In driving the economic powerhouse that is modern China there is probably no sector that has done more than the auto industry. In the two decades or so since it was chosen as one of the country’s pillar industries, not only has it helped China become the world’s biggest maker and seller of cars, it has pulled a considerable part of the economic load, contributing more than 6 percent of GDP and about 13 percent of the country’s tax income in 2010. But the roads of big Chinese cities are now bursting with cars, and it has become clear that the auto industry has hit a barrier. As efforts to restructure the economy steam ahead, policymakers have been on the lookout for other engines of growth, and some now have their eyes cast in one direction: the sky. What they have in their sights is general aviation, an industry that includes civil aviation other than commercial flights, and includes activities such as search and rescue, private flights and air charter services. In 2010 China’s cabinet named general aviation as a strategic industry in the 12th Five-Year Plan (2011-15), and in November this year the country’s air traffic management authority announced that airspace regulations would be relaxed from the beginning of next year. On top of that, in July the State Council issued guidelines for the development of the civil aviation industry, including estimates that flying time in general aviation will increase by an average of 19 percent a year between now and 2020. All of those signals are being interpreted in the industry as permission for takeoff. "General aviation has emerged as the next economic driving force after the car industry," said Ma Xin, deputy director of the National Air Traffic Management Committee Office in China, at the ninth Zhuhai Air Show, the largest international aerospace trade show in China, last month. "It’s a high-tech sector. It has a long industrial chain that can drive the development of various sectors from raw materials in the upstream, to after-sales and maintenance services in the downstream. It has a much bigger role to play in China’s economy." Ma said changes to the low-altitude airspace management system will spread from test areas to the rest of the country. Communications and surveillance facilities have already been built to ensure flight safety at the beginning of next year, and a trillion-yuan market is about to take off, he said. "As reforms forge ahead, we believe the general aviation industry will gain momentum and, as with cars, will become a new growth point." General aviation is not new to China, but it is one of the few sectors that have not experienced strong growth over the past 30 years, hemmed in by stringent airspace rules that have given priority to military, and now increasingly commercial, flights. For every takeoff, private aircraft owners have to go through a laborious process to obtain approval from the aviation authority. That has given rise to so-called black flying – taking to the air without approval – which has become more prevalent as rich Chinese splurge on their own aircraft. Gao Yuanyang, director of the general aviation industry research center at the School of Economics and Management at Beihang University in Beijing, said that generally when a region’s GDP per capita exceeds $4,000 it is ready for a general aviation industry. "If its GDP per capita exceeds $10,000 a year it is ready for the development of business jets." Gao said China is more than ready for general aviation because its GDP per capita exceeded $4,000 a year in 2010, and per capita GDP in the well-developed Pearl River and Yangtze River deltas has surpassed $10,000 a year. "You need only compare the industry in China with that of the United States to see the potential," he said. In the US there were 230,000 aircraft last year, and the industry took in $150 billion and employed 1.2 million people. In China there were fewer than 1,200 registered aircraft, relatively few jobs and turnover estimated to be a fraction of that in the US. "China’s population is four times that of the US, and geographically China is as big, so the potential is obvious," Gao said. Since China’s reform and opening-up policy was launched in the late 1970s, nearly all the sectors that could turn into strong industries on a par with the potential that the general aviation industry has shown have done so, he said; general aviation has not. Christopher Jackson, a consultant in general aviation and director of project development for Genesis Investment of Shanghai, the sales representative in China for Cessna Aircraft, agrees, saying that general aviation accounts for 1.5 percent of US GDP. "General aviation in China accounts for around 0.0015 percent of GDP," said Jackson, who has been following general aviation in China for 12 years. "As the country tries to change its economy, drives its domestic consumption and creates jobs, the government sees general aviation as a major driving force to achieve that goal." During the 1990s in China, the car was affordable to few, but it later shed its luxury status, and as sales grew, making it a mainstay of tens of millions of lives, it was transformed into an economic locomotive. A similar trajectory is forecast for the general aviation industry. The National Bureau of Statistics says the country produced about 700,000 motor vehicles in 1991. Ten years later 18.5 million rolled off the production line, nearly 17.8 million of them being sold to Chinese. The market for general aviation aircraft, ranging from helicopters to single-engine planes to business jets, is obviously a lot smaller, but it is the minuscule 1,200 registered aircraft that has the heads of industry insiders spinning. Among them are aircraft makers, particularly in North America and Europe, which have a much longer history in developing general aviation than does China. One such is Piaggio Aero of Italy, which delivered its first aircraft to China last month, and which nurses ambitions of being a big player in the Chinese market. "Europe and the US have been our largest markets for a long time," said John Bingham, chief marketing officer of Piaggio Aero. "But China has the most opportunities to become the largest market in the future, because of the booming economy and people’s increasing desire to embrace what is in fact a much better way to travel." The European and North American markets have been in a lull because of the economic slump "for a ridiculous amount of time", Bingham said, "so we decided to open new markets to gain certifications to sell in 2009". "We decided we could be more aggressive. We could go for some new markets, such as China." In doing so, the company has teamed up with the Chinese distributor CAEA Aviation Investment Company, and was due to hand over two P180 Avanti II twin turboprop aircrafts to the Beijing company by the end of this year. The aircraft is to be operated by CAEA subsidiary Free Sky Aviation in a new club-style shared-use program for private clients, Bingham said. The company is confident of its future in China, he said. Piaggio Aero is not alone in seeing the potential of the industry in China. The first time Bingham came to the Zhuhai Air Show, in 2004, just 12 aircraft were on display. At last month’s show there were 100, illustrating how important China has become for aircraft makers, he said. The Civil Aviation Administration of China projects that the number of general aviation aircraft will grow from about 1,200 now to about 2,000 in 2015 and between 10,000 and 12,000 in 2020. Despite a slowdown in the economy, nearly all major companies remain optimistic about the Chinese market. In fact, aircraft makers and consultancies say that China is one of the markets driving demand in general aviation. A report by aircraft maker Bombardier predicts that 600 new business jets will be delivered to China by 2019; at present there are little more than 100 in the fleet. That is in line with strong purchases in the three years to 2011, when the number of business jets grew from 20 to 109. Gao of Beihang University said the number of business jets in China almost doubled from 2010 to 2011, and the new orders for business jets from China is about 20 percent of orders worldwide. Bombardier said in its report that worldwide demand for business jets correlates with wealth creation, which is largely driven by economic growth. A report in 2010 by Forbes said there were 1,011 billionaires in the world, 27 percent more than the previous year. The biggest rise was in China, where the number more than doubled to 107. In China the increasing number of billionaires and multimillionaires has also driven up sales of other aircraft, such as helicopters. At the start of this year, Bell Helicopter of the US, which first entered China in 1979, had 24 helicopters in service in the country; the company said that it will end the year with almost double that. "China represents the largest potential market in the world," said John Garrison, president and CEO of Bell Helicopter. "According to the recent forecasts there is a projected need for as many as 2,000 helicopters in China." Bell said he believes the country "can easily support" 2,000 helicopters in 10 years as the pace of airspace regulation reforms picks up. But China still lacks infrastructure such as airports for general aviation, and personnel, such as pilots and product support and maintenance, he says. With the stringent airspace rules, those two areas have been seen as a serious obstacle to the development of general aviation in China. "You can have as many aircraft as you want, but without the infrastructure it is like having a Ferrari sitting in the middle of a rice field with no roads to drive," said Jan Fridrich, vice-president of the Light Aircraft Association of the Czech Republic. The Czech Republic is a good case study of a country that has built a light aircraft industry from scratch. In just 10 years it has grown to an industry that produces 350 aircraft a year with an export value of 36 million euros, Fridrich said. The key is to provide a complete system of infrastructure essential to the industry, he said. Just as the car industry has been turbocharged as roads have been built across the country, a thriving general aviation sector cannot grow without a highly developed network of airports. There are now about 92 million automobiles in China, and many of them are now being driven on roads that have sprung up in the past year. In 2011 slightly more than 55,000 kilometers of road were opened, about 9,000 km of that being motorways, the statistics bureau said. In 1992 less than 2,400 km of road were built. Investment in large infrastructure has obviously been a huge driving force of the economy, and investment in general aviation is forecast to play a similar role. More importantly, unlike large infrastructure dominated by investment from State-owned enterprises, the building of general aviation airports may well be open to foreign investors as well as private Chinese companies. "Building airports for general aviation is not a mega project like building Beijing Capital International Airport," said Zou Jianming, chairman of Shanghai Zenisun Investment Group, a private Chinese company whose roots are in real estate development. "We’ve built five airports in Hainan and Fujian provinces over the past two years, and we plan to build 30 for general aviation by 2020." The company said the investment required to build airports varies widely, depending on their size, and the airports Zenisun has built cost between 100 million yuan and 150 million yuan. Zou entered the industry because of his personal interest in flying, first setting up a company to sell helicopters to the wealthy, before starting a general aviation business, which includes charters. The Civil Aviation Administration said there were 286 airports in China for general aviation last year, compared with 19,700 in the US. "To develop the sector we need to have more airports, at least one airport for each county in China," said Jin Qiansheng, director of the administrative committee of Shaanxi Aviation Economic and Technological Development Zone. That would mean there would be 3,000 airports and landing strips in the country, he said. Jin’s zone, in Xi’an, is a pioneer in developing general aviation in China. About 20 such zones have been built or are awaiting approval. "We’ve built four airports for general aviation in Shaanxi province, and we plan to build 33 more," Jin said. Last month his zone signed a memorandum of understanding with a US company to co-fund a private equity worth 10 billion yuan for the development of general aviation in China, he said. "That’s a good first step for us in attracting foreign investors. There is about 250 million yuan in the previous fund we set up with the local government in Shaanxi and private companies. With small amounts like that you can hardly play serious games, as with general aviation." The auto industry in China employs 40 million people, and if the general aviation industry is to take off it will have its work cut out to provide the labor and skills needed. However, there is a gaping hole at the moment, and that is providing huge opportunities to those who can offer pilot training, product support and maintenance and more. "There are not enough pilots," said Jackson of Genesis Investment, which began to look at investing in general aviation since last year. "Call any flight training school in the US and they will probably tell you there are some Chinese pilots training there. It is even difficult to find catering companies for business jets in China. If you want to have food you need to call those commercial airlines for help." 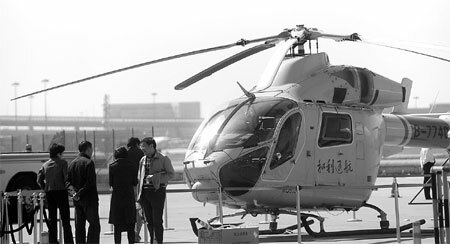 Garrison of Bell Helicopter said the rapidly increasing demand for helicopters in China will require thousands of professionals to fly and maintain these aircraft. "There is not only an opportunity to help create these jobs, but also ensure China has access to the best operational and technical training possible." The world’s leading business-jet maker, Gulfstream of the US, is also moving to strengthen its position in China by adding more Chinese personnel to its Beijing service center, which opened last month. "It is our first center in the Chinese mainland," said Roger Sperry, a regional senior vice-president with Gulfstream. "With this center it will be more cost effective for our customers in China to have services in the mainland rather than going to Hong Kong or Singapore." Sperry said that with demand for Gulfstream’s business jets gradually shifting from North America to Asia and Latin America, more support staff are needed. "China is one of the major driving forces for our new orders." Last year 102 Gulfstream jets were stationed in China, he said; 10 years earlier there were none. The company has already added about 1,400 employees this year, including those at its Beijing service center, and in a department in Hong Kong it also opened this year. Some aircraft makers have gone further to set up local production, creating more high-tech jobs in China. Diamond Aircraft of Austria, a single-engine plane maker, has had a joint venture in China since 2005. "Having a local production base in China is an advantage as we can reach markets we couldn’t access before," said Gernot Brabner, executive general manager of Binao-Diamond Aircraft of Shandong. "We’ve even considered increasing our capacity from 60 aircraft to 100 a year from next year." Cessna Aircraft signed agreements this year to join the government of Chengdu, in Sichuan province, and the State-owned Aviation Industry Corp of China in a joint venture to produce mid-sized business jets and possibly other new models in the future. Many more joint ventures are expected to mushroom in China, in a similar path that the auto industry took, experts say. For Bingham, of Piaggio Aero, the lack of infrastructure hold challenges for the industry in the short term. "But the Chinese government has committed so much to developing this sector, and they have realized that they are way behind on aviation. General aviation is going to develop in the typical Chinese way. After being the last, they intend to be the first."